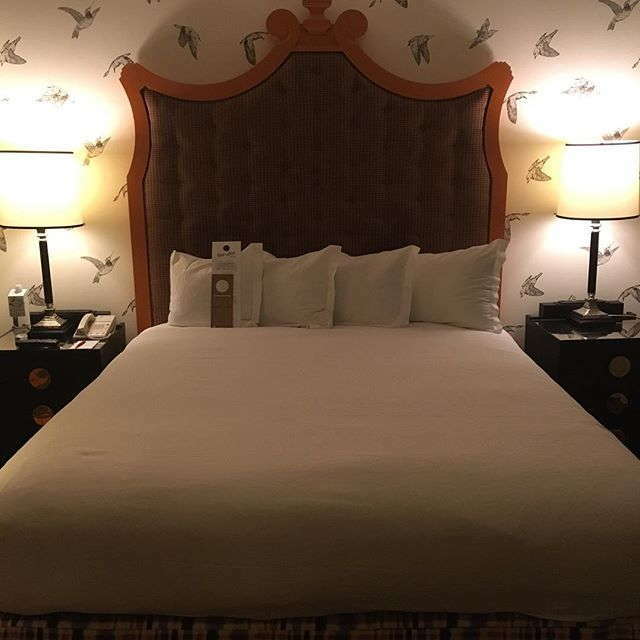 If “drama,” “glamour,” and “luxury” are words you use to describe your ideal hotel, Kimpton Hotel Monaco Portland is a must-stay on your next trip to the city. 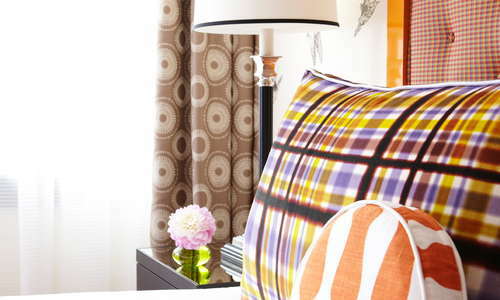 This stunning property has a playful yet elegant style, mixing bold colors and patterns, artistic touches, and modern amenities for a truly one-of-a-kind feel you won’t find anywhere else in Portland. 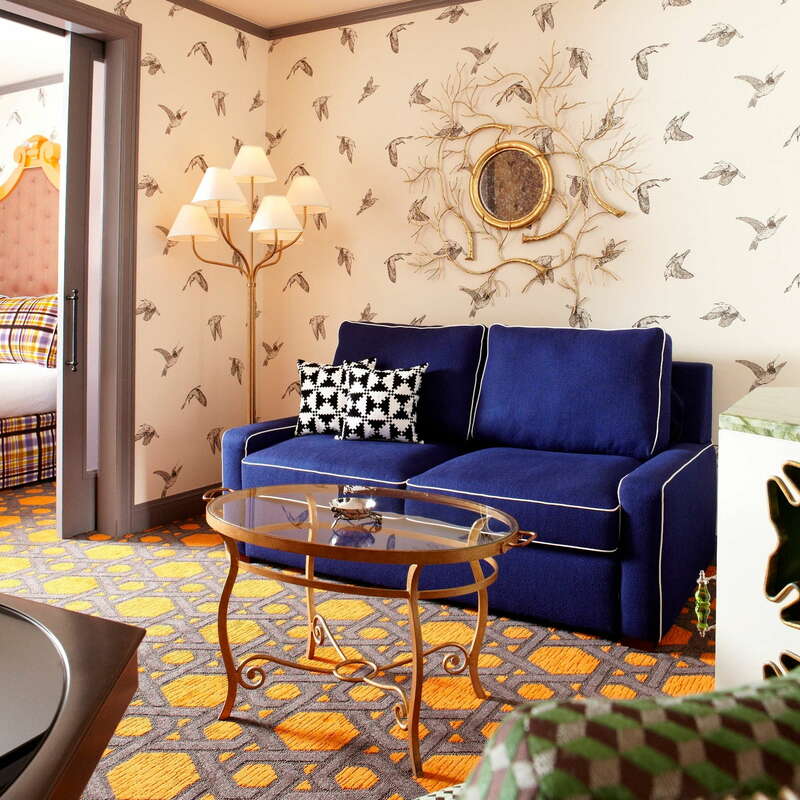 There are large hotel rooms… and then there are the rooms at Kimpton Hotel Monaco Portland. 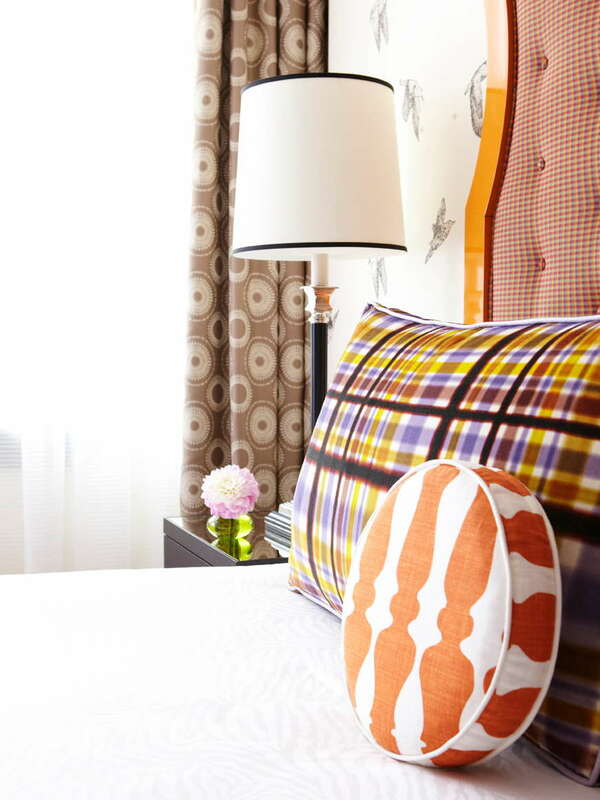 The 221 guest rooms are nice and spacious (between 300 and 850 square feet, depending on room type) with decor that feels just as whimsical and fun as the rest of the hotel. Unless you’re traveling in the summer, chances are you’ll encounter drizzle at least one day during your stay. 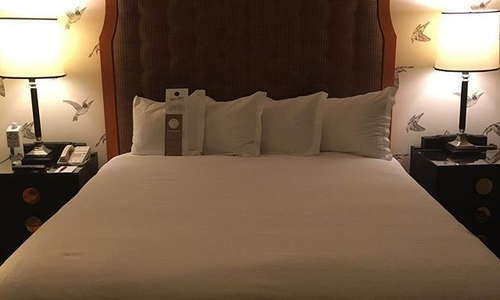 But no worries - Kimpton Hotel Monaco Portland stocks each of their rooms with umbrellas so you don't have to fight the rain unprepared. 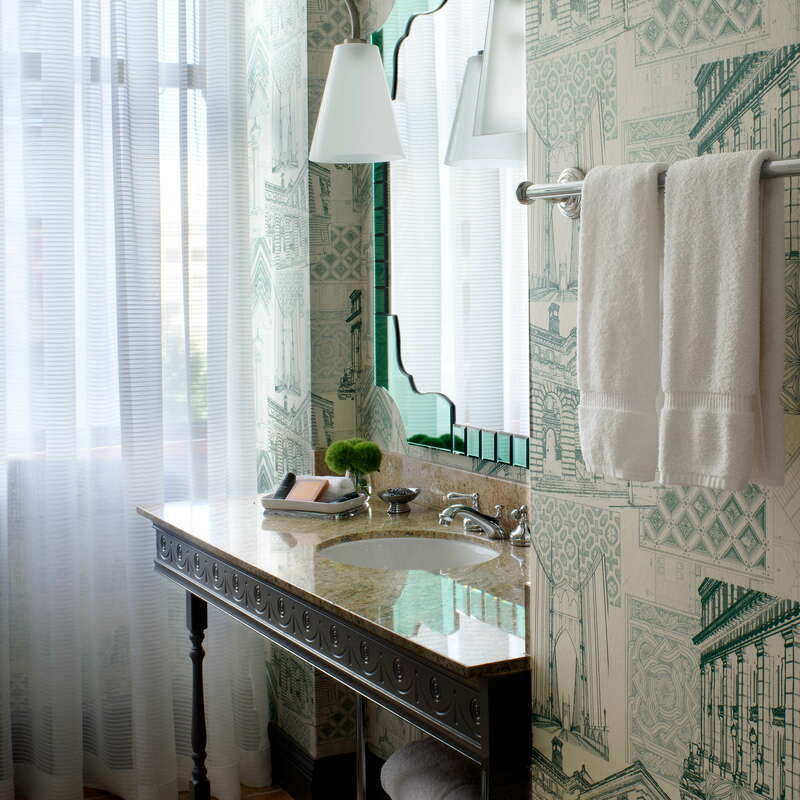 The bathrooms at Kimpton Hotel Monaco are gorgeous. 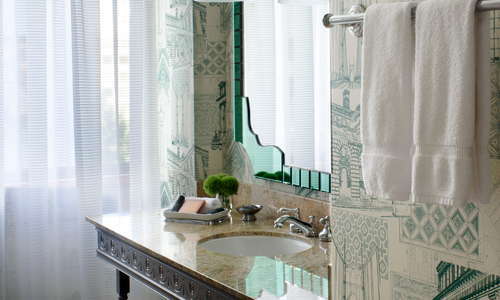 From the marble countertops to the patterned wallpaper, the spacious shower to the Atelier Bloem bath products, it's clear no detail was spared during this bathroom design. 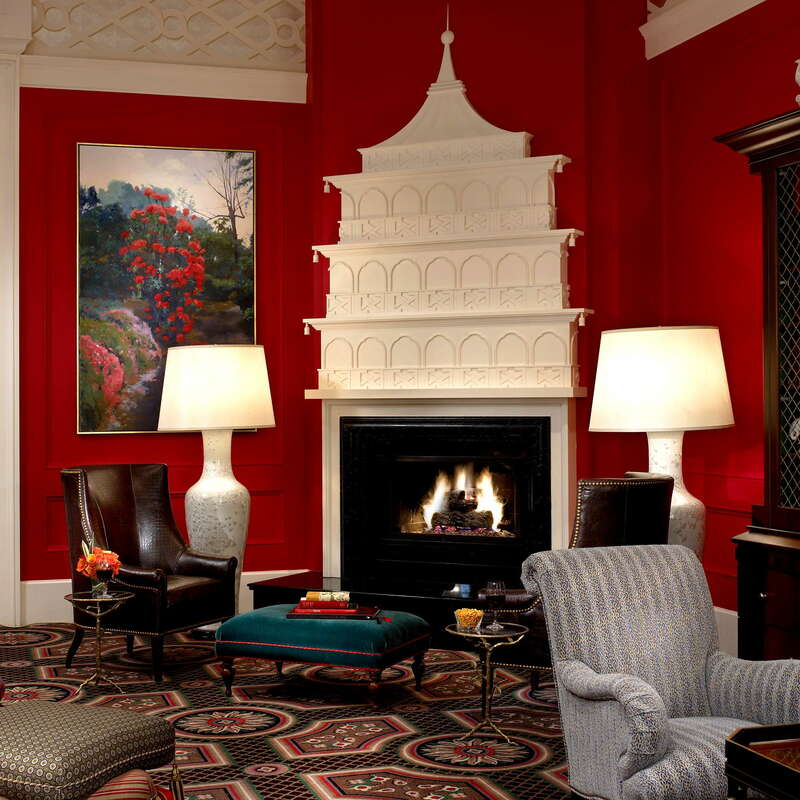 The lobby at Kimpton Hotel Monaco Portland manages to be both warm and inviting and spacious and open. 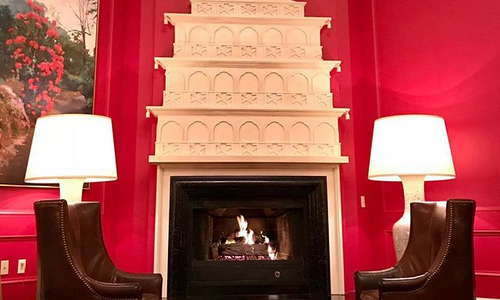 The stunning architectural features, the fireplace, and the plush seating make this a natural area to snuggle up and relax. 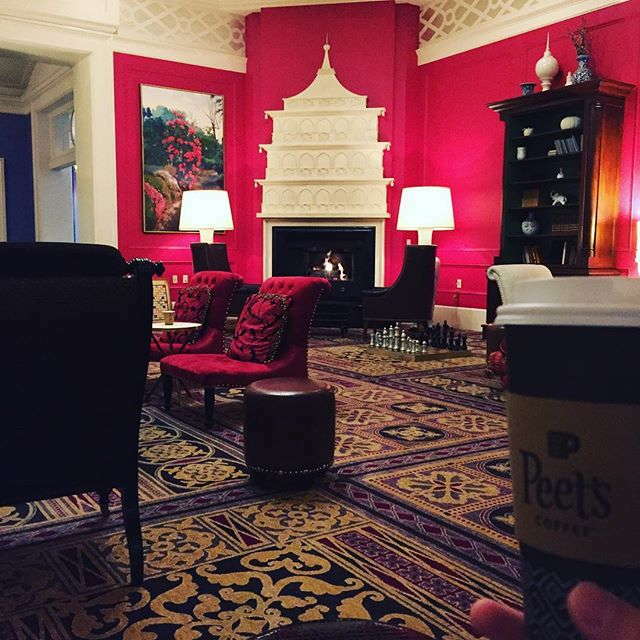 Make sure to stop by in the morning for complimentary tea and coffee service and then again at 5 p.m. for the hotel’s nightly social hour. 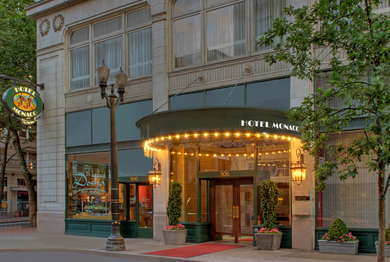 YOU SHOULD KNOW Kimpton Hotel Monaco Portland is dog-friendly - and that includes some of the lobby events. If you don’t want to spend your social hour with a bunch of pups, you might want to venture outside of the hotel. 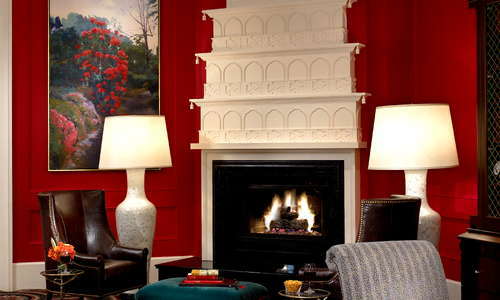 Kimpton Hotel Monaco Portland is home to Dosha, a full-service Aveda salon and spa. Stop in for a massage or indulge yourself with one of their full-day spa packages, which include services like facials, spa manicure and pedicures, and hair styling. The fitness center is open 24/7 and has everything you need to get a killer workout, including cardio machines with individual TV monitors, free weights, and yoga accessories. Red Star Tavern serves Northwest-inspired American classics made using fresh, local ingredients. Enjoy inventive dishes like Crisp Garlic Chickpea Cakes and Slow Roasted Pork Shoulder while chatting with other guests at the restaurant’s large communal dining table. 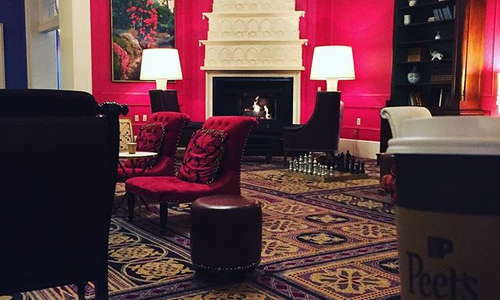 Stop by social hour every day in the lobby at 5pm for live jazz and samples of some of the Portland area’s best wine, spirits, and craft beers. 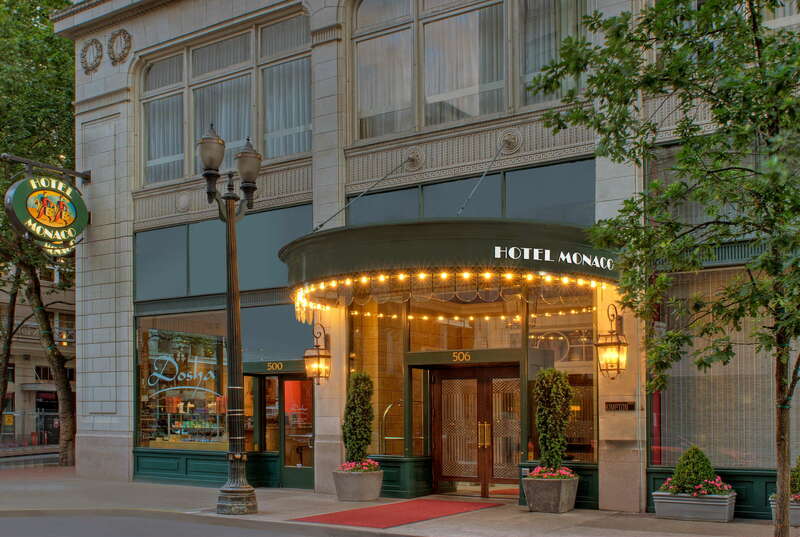 You can easily explore downtown on foot, and if you want to get elsewhere in the city, Portland has an excellent public transportation system (there are multiple MAX Light Rail Stations and bus stops within a two-block radius of the hotel). If you want to explore the city in true Portland style, stop by the front desk and ask to borrow one of the hotel’s bicycles free of charge. 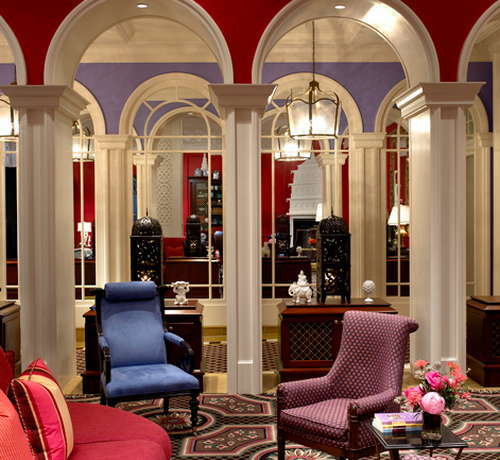 If you do decide to bring a car, valet parking is $42 per night. Grab breakfast at Mother’s Bistro & Bar (4-minute walk), where you can enjoy classics with a twist like Crunchy French Toast (french toast crusted with corn flakes) and Wild Salmon Hash in a cozy, shabby-chic interior. Later in the day, head to the Alder St. Food Cart Pod (6-minute walk), where you can find just about every cuisine under the sun - including grilled cheese, kebab, Thai, and Italian subs--in huge portions for can’t beat prices (you’ll be hard-pressed to find dishes that cost more than $10). Sample some great local brews at Bailey’s Taproom (5-minute walk), which has 26 rotating beers on tap (and focuses on Oregon breweries). If you’re more in the mood for a cocktail, head over to Teardrop Lounge (11-minute walk), a swanky lounge with an impressive collection of both original and classic cocktails (be sure to try The Tempest, a whiskey drink that has both sweetness and a nice little kick, courtesy of honey liqueur and Compari). 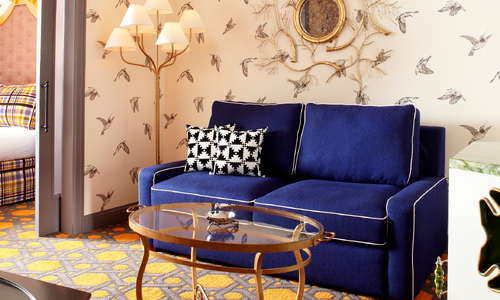 You’ll be hard-pressed to find anything not to love about Kimpton Hotel Monaco Portland. 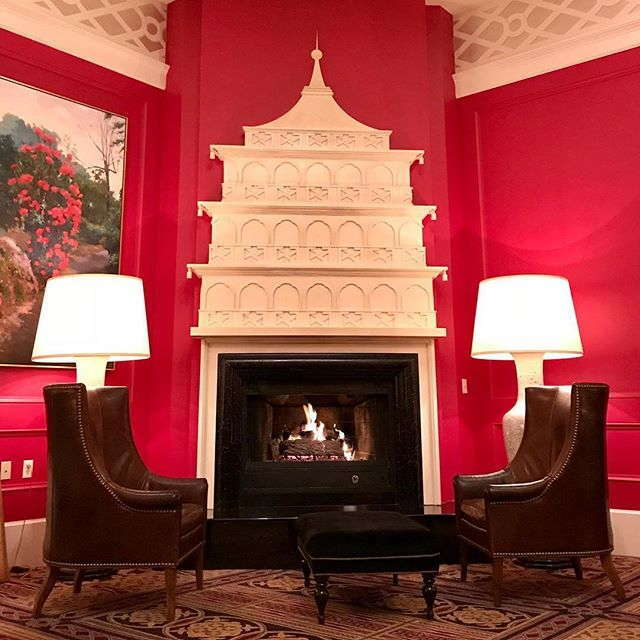 The ambiance, the location, the decor, and the amenities are all top-notch.